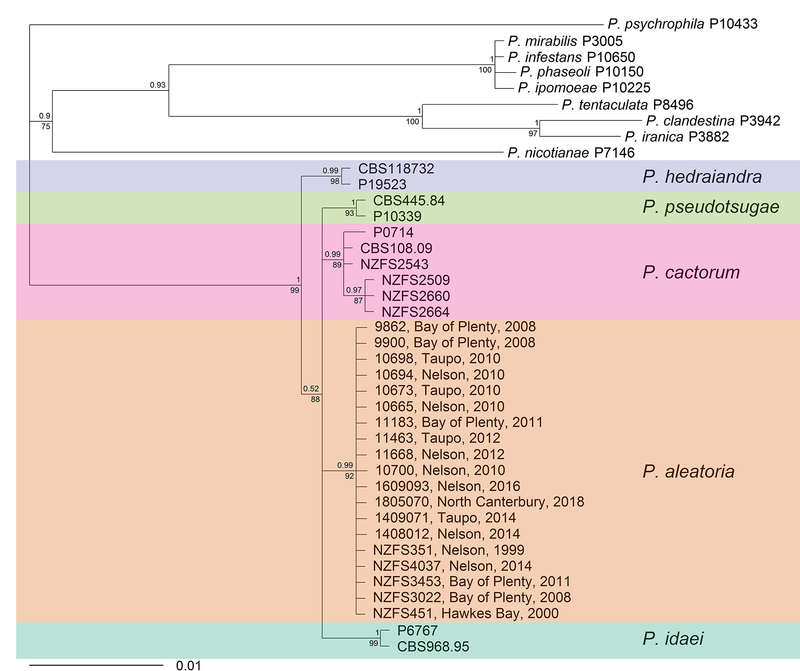 During routine surveys of Pinus radiata plantations in the Nelson region, New Zealand, a Phytophthora species was isolated in association with bleeding stem cankers and rhizosphere soil. This isolate grew more slowly than other Phytophthora species associated with P. radiata in New Zealand, and was morphologically similar to isolates of Phytophthora cactorum previously associated with horticulture production, and isolates that were morphologically identified as P. cactorum from P. radiata in Nelson since the 1970s. 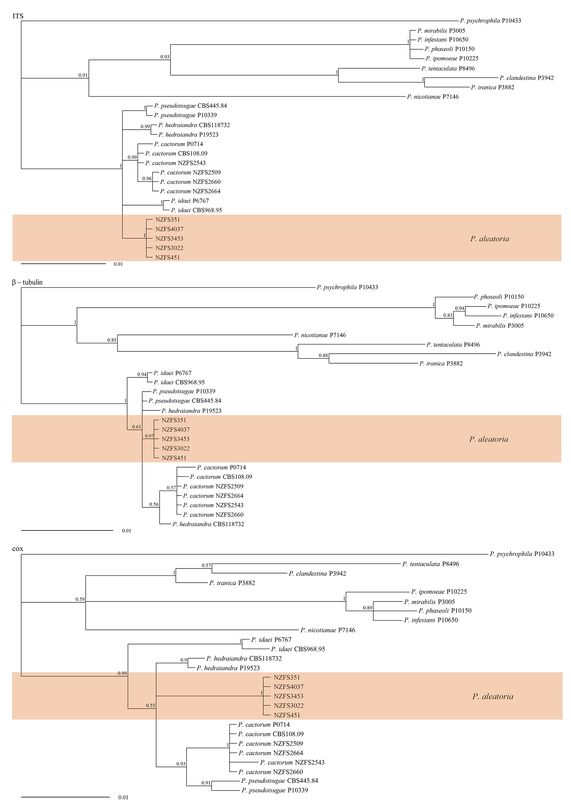 Phylogenetic analyses of the ITS, cox1, and ß-tubulin _F1A and ß-tubulin_F2A regions confirmed this to be a new species closely related to P. hedraiandra in Clade 1. 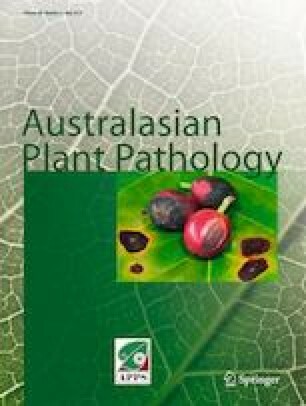 The new species is described here as Phytophthora aleatoria sp. nov. It produces partially caducous, papillate, ovoid to rarely globose or limoniform sporangia, markedly aplerotic oogonia forming thin-walled oospores, and paragynous (mainly) or amphigynous antheridia on some cultures. To date, this species has been confirmed on P. radiata in New Zealand across a range of sites within the North Canterbury, Nelson, Hawkes Bay, Taupo and the Bay of Plenty regions. The online version of this article ( https://doi.org/10.1007/s13313-019-00631-5) contains supplementary material, which is available to authorized users. This work was funded by MBIE (CO4X1305), the Forest Growers Levy Trust (administered by the New Zealand Forest Owners’ Association) and the Radiata Pine Breeding Company under the “Healthy Trees, Healthy Future” research programme at Scion (NZFRI, Ltd). Strategic Science Investment Funds (MBIE, New Zealand) were also utilised for this study. Nicole Silvester, Rita Tetenburg, Sara Carey, and Tomoko Pearson are acknowledged for technical assistance. Scion’s Forest Research Culture Collection housed and maintained all the isolates used in this study.